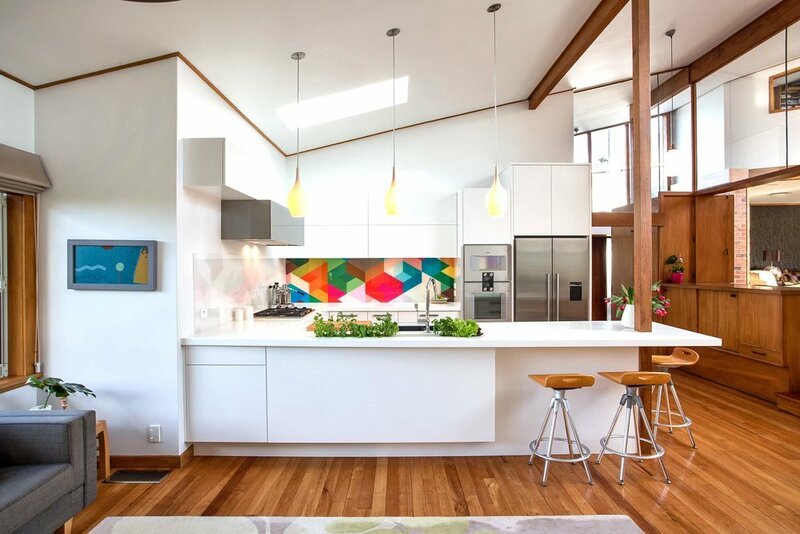 This month Image Glass talks to Toni Roberts from Kitchen Architecture about her inspiration for a kitchen she designed for an Auckland retro home. What was the brief for this kitchen and what challenges had to be overcome to achieve the overall result? The homeowner, Sarah, and I had worked together on a previous project so we approached this new design with oodles of confidence in our collaboration. While wanting a fresh white kitchen, she requested one with ‘soul’ and a tad edgy. We were limited by the existing footprint and a timber post then new larger appliances and three decent seat spaces also needed to fit. Dramatically high raking ceilings demanded scaling, so cabinetry was stepped up to draw the eye upwards, with an asymmetric layering effect of horizontal elements carried through, also stepped. How did the geometric printed glass become part of the brief? Sarah had seen this geometric effect in 2014, so even after two years of pondering it while waiting for leaky roofs to be finished, she still loved its drama and colour. We knew glass would be the best material to achieve the intense colour and gloss factor desired. It was then in close consultation with Image Glass’ graphic designers, we together were able to manipulate the geometry, scale and colour tones of the various triangles to achieve the 3D box-look illusions. Several iterations and three full-scale, colour proofs later, we settled on the final image. It was a fun, creative process with the technical elements made easier by the helpful team at Image Glass. Why did you decide to create a tone-on-tone version? Wanting an easy clean surface behind the gas hob and rather than introduce another material, we developed the same pattern as a subtle monochromatic version, executed in another rectangle of similar proportions. This creates a sense of anticipation as you enter the kitchen from beside the fridge. It begins to reveal its character (or ‘soul’ as Sarah calls it) hinting at the unfolding drama soon to be discovered. Again, experiments with glass sample proofs before the final production print ensured the green tint naturally found even in low-iron glass was colour corrected to the desired charcoal hue. We can see that a painted glass face was also selected for the rangehood door above. Why is this? Yes, I deliberately did this for a few reasons. The metallic-flecked charcoal colour becomes a unifying element to the other steel appliances (a nod to it being an appliance albeit concealed), its glass finish imitates the ovens’ reflectivity and the desire to distinguish the unit from the white satin lacquered cabinetry enhances the overall look. Image Glass is here to help you create a unique and customised design for your kitchen projects.